I’ve been quite vocal in my displeasure at the recent changes at Branded Surveys (formerly Mintvine), but thought I’d log in and see what’s going on this morning. It appears that as part of their ‘new and improved’ changes, they’re beta testing a new dashboard style, and it’s a vast improvement on the ‘roulette’ style dashboard they had before, where you couldn’t pick and choose which surveys you were offered, only choose to reject ones you thought weren’t worth the time / points / effort. How do I see the new dashboard? At the bottom is the Daily Poll, so everything is nice and neat in one place. What do you think of the new dashboard view? 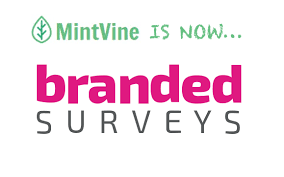 Are you still using Branded Surveys? If not, why not? Let us know in the comments below! « Earn SB with Swagbucks by scanning your shopping receipts – coming soon! I got enough to cash out last month so haven’t used it since but I think I’ll give it another go now.